The Travel Guide to Cairo highlights the most important places to visit in this area of Egypt and its significance to the history of Egypt together with Ancient Egyptian facts and information about Cairo. Cairo is the capital of Egypt with a population in excess of 16 million people. Although Cairo is synonymous with Egypt, and despite its close proximity with the Great Pyramids of Giza and the Sphinx, its history does not date back to the Pharaohs of Ancient Egypt. Cairo contains some historic Islamic mosques and examples of Roman and medieval architecture. The earliest known settlement in Cairo was at the Babylon Fort built by the Persians in the 6th century BC. The first records of the city date back to the Roman conquest of Egypt. In 31 BC the Roman Emperor Octavian defeated Antony and Cleopatra in the sea Battle of Actium and in 30 BC Egypt became a province of the Roman Empire which stretched from 30BC to 641 AD. A Roman fort was built on the site of the Babylon fort. Visit the Egyptian Museum containing the greatest collection of Egyptian antiquities including the treasures from the tomb of Tutankhamun. Our Egypt travel guide differentiates between the sites of Upper and Lower Egypt. 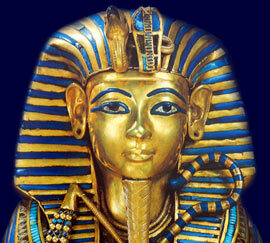 Ancient Egypt originally consisted of two parts which were called Upper and Lower Egypt. Cairo is located in Lower Egypt. Upper Egypt was the valley area in the South and Lower Egypt was the delta area in the North. Upper and Lower Egypt each had their own governments and rulers. These two parts Egypt were eventually united in 3118BC. Plan your Tour of Egypt around the most important and ancient sites of Lower Egypt, including Cairo, using our travel guide.